Manchester Twp. 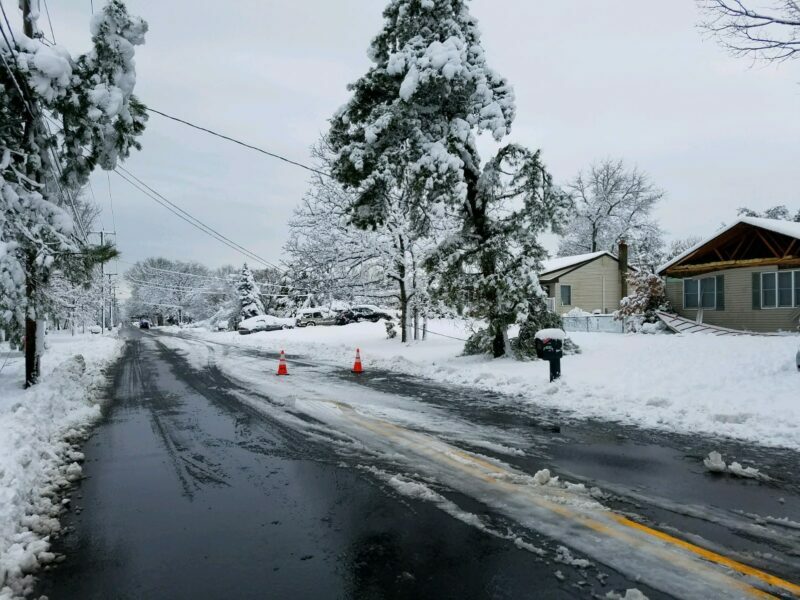 NJ – As Winter Storm Toby leaves the area, both residents and Township officials have begun to assess the damages left in its wake. Prolonged hours of heavy wet snow and moderate winds caused numerous powerlines and tree limbs to sag or break free and fall to the ground. As of Thursday morning, approximately 1600 residents are without power throughout the township, many of which are on the east end of town. In response to this, the Manchester Township Office of Emergency Management has established a warming station at the Ridgeway Volunteer Fire Department on Route 571. Residents without heat or electric are encouraged to go there. The warming station is fully staffed with volunteers and coffee, water and donuts are available. Throughout the night and early morning hours, our officers have been responding to reports of low-hanging or downed power lines and have closed roads where a potential hazard has been located. One such location is on the 1300 block of Broadway Boulevard in Pine Lake Park, where the force of the downed power lines pulled the front façade of residence off. No one in the residence was injured and emergency crews have been dispatched to the area to address the low hanging wires. Lucky, a beneficial spring-time sun angle as well as warm daytime temperatures should help to quickly melt the heavy, wet snow on tree limbs and power lines. Residents, however, need to be cautious and pay close attention to snow on power lines, tree limbs, and especially on roof tops as rapid melting may cause large amounts of snow to break free and drop unexpectedly. We encourage everyone to be cognizant of their surroundings when outdoors. Call the police department immediately to report a fallen power line. Wait until the fire department, police or JCP&L workers tell you it’s safe to get out of your car before exiting the vehicle.